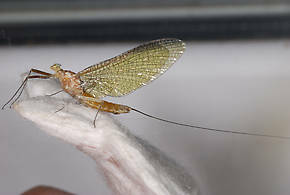 Ironodes nitidus (Slate Maroon Drake) Mayfly Adult View 3 PicturesWhile relatively rare in most of western Montana, it is common in several small streams along the east side of Flathead Lake and streams on the south side of the Flathead Indian Reservation. Limnephilus externus (Summer Flier Sedge) Caddisfly Nymph View 1 PicturesThis caddis is one of the most abundant caddisflies in temporary ponds of Glacier Park. 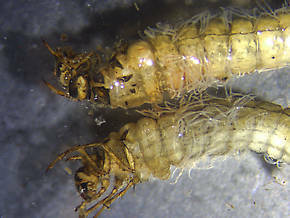 The larvae build a round case of detritus (Detritus: Small, loose pieces of decaying organic matter underwater.) and dead plant material that can get quite large. Detritus: Small, loose pieces of decaying organic matter underwater.